Glanton Dowdell, a Detroit native, was born August 1923 (1), and lived under difficult circumstances, dropping out of school by the 6th grade. After spending time in and out of different correctional environments in his youth, he was sentenced to Jackson prison on the charges of murder and robbery in the 1949. At the State prison, he experienced a personal renaissance, becoming an avid artist and important resistance leader. After a successful time in prison selling artwork and teaching fellow inmates, Dowdell was released early. Around 1967, Dowdell, along with fellow Detroiters and political activists General G. Baker Jr. and Rufus Griffin, established the Detroit chapter of the Black Panther Party. Dowdell was also elected Vice President of the Citywide Citizens Action Committee, an organization focused on “community cohesion” and providing a unified voice for the African-American populous in Detroit (2). Upon more confrontations with law enforcement, Dowdell emigrated to Sweden, where he died in 2000 (3). Dowdell will always be remembered for his artwork, activism, and commitment to civil and human rights. 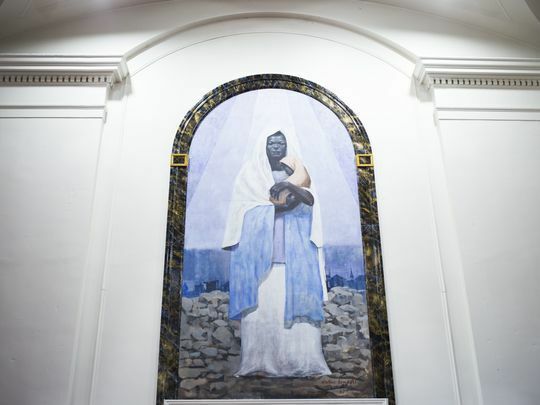 His most famous painting, "Black Madonna" speaks to how Dowdell's artistic creation is honored by Black Detroiters (4). Dowdell had long been a student of art and inherited a strong passion and ability for art from his grandmother (5). As a young man, Dowdell had multiple run-ins with the law and economically had a difficult time securing decent paying employment. Like many African American men of his generation, the young Detroiter frequently labored as a factory worker and painted charcoal portraits for clients. Upon entering Michigan’s criminal justice system, Dowdell struggled with prison life. Historically, carceral institutions (i.e., prisons, jails, penitentiaries) have not adequately catered to the needs of those in their care, both physically and emotionally. These institutions, especially with the rise of mass incarceration since the late 1960’s, continue to struggle to offer inmates with the necessary tools and programs needed to fulfill their “correctional” or “rehabilitative” goals. This was the case for Dowdell; However, he quickly realized that his artwork provided him with the opportunity to explore himself and fight back against the “harsh and brutal” aspects of the prison system (6). The artistic endeavors of Dowdell, and other inmates just like him, exemplify a form of passive resistance. This expression of resistance challenged the intended purpose of the carceral space. A part of the supposed effectiveness of incarceration is the way in which it is designed to strip one of their identity and individualism. Given the tools to survive and nothing more incarcerated peoples are not expected to hold on to their humanity. Art and other leisure time activities allowed incarcerated men to do so. In doing so, in simply indulging in a niche of existence that allowed them to mentally escape, they resisted. Art reinforced / showed inmates humanity, refuting societal views that imagined them as criminal who were unworthy of decent treatment. For many, artistic work offered purpose and meaning. For Dowdell, one of the most important aspects of art was its power to transform. Art gave Dowdell purpose, saying, “I can determine my function as an artist, which is primarily, that of a transformer, one who can put my sensations into understandable and unified works of art,” (7). In this sense, art acts as a filler, removing Dowdell from the realities of prison life. In addition, art represented a kind of self-assessment, through which he could evaluate his transformation as an individual. Not only was he able to use art for personal growth, but Dowdell also taught an art class at the prison, acting as a conduit for the influence of art as an opportunity for transformation and escapism. Glanton Dowdell serves as a spotlight example as to just how powerful leisure activities, in this case studio art, can be to the success and wellbeing of an incarcerated person. The positive impact of art does not stop at the prison walls. Serving as a bridge between the outside world and inmates, art provides a level of human connection that otherwise would be lacking. Leisure time activities in Jackson Prison enhance our view of the typical inmate experience and serve as an important reminder to continue to fight for and support rehabilitative leisure in prisons today. "Dr. Karl Gregory, September 1st, 2015." Detroit 1967 Online Archive. 2016. Accessed November 18, 2018. https://detroit1967.detroithistorical.org/items/show/249. Glanton Dowdell || Artist. Accessed November 18, 2018. http://www.glantondowdell.org/about.html. Warikoo, Niraj. "Detroit's Black Madonna Turned Church into Social, Political Force." Detroit Free Press. April 28, 2017. Accessed November 18, 2018. https://www.freep.com/story/news/local/michigan/detroit/2017/04/27/detroit-shrine-black-madonna/100947864/. "Clipping from Detroit Free Press." Newspapers.com. Accessed November 18, 2018. Page3. https://www.newspapers.com/clip/24613848/detroit_free_press/. "About." Glanton Dowdell || Artist. Accessed November 23, 2018. http://www.glantondowdell.org/about.html. "About," The Prison Arts Coalition, July 18, 2018, accessed November 04, 2018. Helen Appleton Read, "Prisoners' Art at Grand Central Art Galleries," The Brooklyn Daily Eagle (New York City), April 1, 1934.